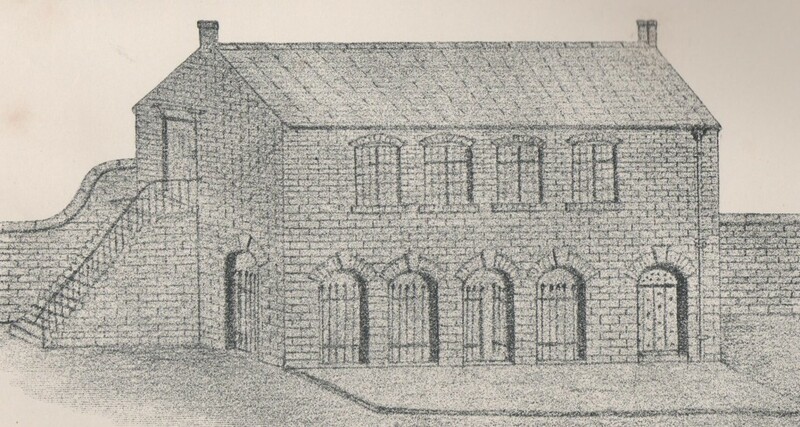 This block stood under the north Church wall, approximately on the site now occupied by the present-day toilet building and was directly opposite Thomas Merry’s business premises. It was open along its front, protected only by iron railings. A sketch of it is to be found in Trueman and Marston. In front of the Butter Market, for a time, stood the stocks, which were removed in the mid-1840’s. Writing in the Advertiser in 1917, Gisborne Brown – born in 1842 — recalled that the Roundhouse was “an oblong building, consisting of two rooms, the first one unfurnished, 8 or 9 feet long and 7 feet wide; the second ditto, with the exception of there being a piece of wood, about 4 or 5 inches thick, securely fastened to the wall on the west side, which answered as a parlour and bedroom as well. Sometimes, during school hours, George Small (the only constable in the town at that time) had brought in a drunken man and he would be asleep when we lads came out of school…..we used to knock and shout and kick the door, knowing that he could not get at us, the door being a very heavy one, and studded with octagonal-headed studs; so we plagued him until we were tired and went home”. ‘Tilkestune’ (IA 1929) recalls it somewhat differently: “In the centre was the old butter market-house, and at each side was a square room with a strong, iron-banded door at the end. No windows were to be seen in these rooms. They were black holes, indeed, and into them used to be thrust the thief, the intoxicated, and the common brawler, the women in the ‘black hole’ at one end, and the men in that at the other”. Sheddie Kyme described the whole building as “dilapidated and evil-smelling….its damp walls crumbling with decay, and savouring more of a vault than a place for the market accommodation of those picturesque and cleanly dames who came from the country around to dispose of their butter and eggs”. And the Ilkeston News of 1855 agreed, describing “an ugly excrescence, jutting out from one side of the restored church and completely marring its symmetry, occupying useful space (already reduced to the smallest possible compass by the recent enlargement of the grave yard) in the Market-place, and the reverse of an ornament to the latter”. (IN July 1855). In April 1862 the roof and upper storey of the building were removed, the north wall of the churchyard was lowered and the area between that wall and the church was levelled. The reason seems to have been to present a better view of the Church from its north side. These alterations were not to the satisfaction of everyone however and in May 1868 the Local Board was called upon to respond to a letter, dated May 5th 1868, from the Rev. James Horsburgh conveying the wish of the Duke of Rutland to have the Old Market Hall demolished at once. And when in doubt, form a committee!! — which is what the Board did. ‘Market Hall. Messrs Moss, Ash, Ball, Clay, Carrier, Sudbury, Richards and Wade were appointed a committee to arrange for take down the Old Butter Market Hall, and for erecting another on the same, or some other site; also to ascertain whether the Boys’ School could be removed for the erection of a Market Hall there; and if so the conditions. However it appears that the Butter Market survived the efforts of the Duke to demolish it and seven years later the local press was still complaining about it. “It may interest many fair readers of the Pioneer to know that I have made an important discovery, and one that will tend to restore happiness to many households, whose peace has been disturbed by an over-weening confidence in — butter and eggs. I have found out that the source of complaint so frequently heard of late as to the quality of the dairy produce exhibited for sale in the Ilkeston Butter Market is distinctly traceable to the building in which these comestibles are retailed. What with the damp, dull, dingy, dark, dilapidated vault, the rusty railings, and the putrid atmosphere of the place which has for far too long done duty as a market-house, and its close proximity to the resting place of the departed worth, not to mention the reminiscences of days when it was used as a public gaol, and in neighbourly contact with its equally antiquated friend, yclept the stocks, no wonder that honest butter and eggs can’t stand that sort of treatment, and fall unwell – that is, go bad, — when exposed to view in a place linked with such vile associations. The sooner our parochial magnates look to this, the better will it be for themselves and all around, if domestic peace and happiness is to be restored and maintained in the parish”. The Pioneer seemed determined to get rid of the Butter Market once and for all. It returned to the attack two months later, describing it as “a building in which many pig jobbers would object to house their swine”. It longed for someone to approach the Duke of Rutland, seeking a “more extensive and cleanly premises” to conduct market business. This correspondent had some ‘inside information’ and had learnt that a new Market Hall was to be made available in the upper Market Place (see the new National Schools on the Cricket Ground.) Couldn’t it also be used as a butter and eggs market too? But the ambitions of the ‘Reader and Butter Buyer’ didn’t stop there and he began to get carried away by his grand plans. “A reading and lecture-room over the new hall would be a great acquisition to the town. We have a great Town Hall, which gives no accommodation whatever for the reading public (no public library of course!) or the meeting of working men’s institutes, and the like. The Schools are too redolent of foul air to be agreeable. A good room over the new Market Hall is just the thing needed, and most earnestly do the Ilkeston people hope that the Duke of Rutland will do them this ‘good turn’. It will ‘pay’ infinitely better than a cricket ground, to say nothing of the moral benefits it would be the means of securing to the inhabitants of Ilkeston”. The ‘inside information’ of the ‘Reader and Butter Buyer’ proved accurate and within the year Ilkeston had a new Market Hall incorporating a butter market, in the upper Market Place. It was part of the old National Girls’ School there ( — a new school had been built on the old Cricket Ground). The Local Board had offered £70 pa. to lease the Hall for 21 years from the Duke of Rutland.